BOTTLES, BOOZE, AND BACK STORIES: Maltine: Moving to "The Safe Side"
Maltine: Moving to "The Safe Side"
Maltine turns out to be an extract of malted barley, wheat and oats, highly fortified by alcohol. It was the brain child of John Carnrick (1837-1903), a pharmacologist who invented a whole shelf of elixirs with such imaginative names as Lacto-peptine, Peptenzyme, and Kumysgen, this last a concoction purportedly made from fermented mare’s milk. In general, these nostrums and Maltine were drinks to impart nutrition, improve digestion, and remedy undefined stomach ailments. First merchandised through Carnrick’s drug manufacturing firm, Reed and Carnrick, the product subsequently was sold through a spin-off, the Maltine Manufacturing Company of Brooklyn, New York. Maltine was heavily promoted to doctors through ads in medical journals, trade cards depicting leading doctors and surgeons, and a range of practical giveaway items aimed at physicians. These included a “home call book” -- remember that doctors once made house calls -- and a sign for the door when the doctor was out. All contained plugs for Maltine. 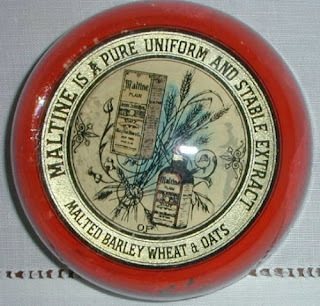 To meet stiff competition for the malt drink market, however, Maltine’s management could not resist going directly to the public. 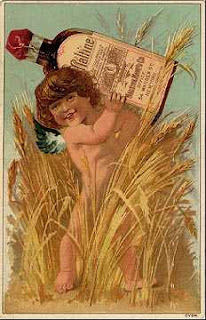 It issued trade cards that showed cherubic youngsters, sometimes hefting a Maltine bottle, thus making the case that their product was safe for children. Widely distributed owl bookmarks claimed: “Its effects in anemia, childrosis [an entirely fictitious medical condition], and other forms of blood impoverishment are almost magical.” Childrosis? Magical? Maltine seemed to be crossing the line of propriety. This kind of advertising predictably brought howls of protests from physicians. 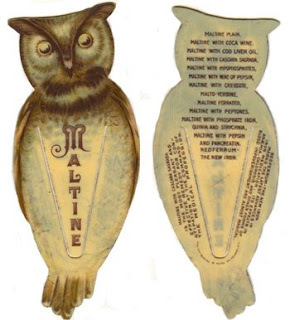 As early as 1894 the company officials in letters to medical journals across the country vigorously insisted that Maltine was not a “patent medicine” and that their intention was to reach patients only through physicians. On the other hand, the company could not resist mixing additional trendy ingredients with Maltine, including cod liver oil, peptones, and a triple combination of iron phosphate -- used today to poison garden slugs -- quinine, and, believe it or not, strychnine. Its best seller, however, became Maltine with Coca Wine. Ads suggested drinking a full glass of this potion during or after every meal. Children were advised to take only half a glass. 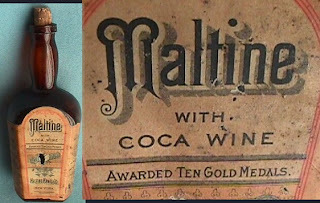 In a given year, 10,000 bottles of Maltine with Coca Wine were sold. Meanwhile, authorities were increasingly concerned about the growing number of cocaine addicts in the country. The substance derived from the coca plant was becoming so popular that it had become a public health problem. Maltine’s management was faced with a dilemma: Dump Maltine with Coca Wine and lose thousands of dollars in sales, or keep selling it and risk angering the medical fraternity. In 1907 a company lawyer provided the answer in a statement to the Federal Bureau of Chemistry, the forerunner of the FDA: “Simply because all these cocaine preparations are getting into such bad odor, the Maltine Company does not want anything to do with one. We thought it advisable to be on the safe side and give up the the preparation altogether rather than get mixed up in something unpleasant.” Ironically, chemists had been able to find only minute traces of cocaine in Maltine with Coca Wine -- not believed enough to lead to addiction. Nonetheless, It was a wise decision. By 1914 Congress had rendered it illegal nationwide to put cocaine in consumer products. The Maltine Company re-established its reputation for being an ethical drug company. It subsequently was bought by Chilcott Laboratories, which in turn was acquired by Warmer Lambert, itself swallowed up by Pfizer, Inc., in 2000. Maltine disappeared with Prohibition. Like your article, content is very good, next time will come again.